All testers must register for 2018-2019 school year prior to the placement test. Registration receipt required at the test site.No exception for current Hua Xia students either. 2) Credit class parent service deposit refund on these days: 4/29, 5/6, 5/13, 10 am - 2 pm, by the office. Do not miss it! 3) Looking for a summer camp? InGenius, the best STEAM camp will host an onsite Q&A this Sunday, 11:30am - 1:00 pm, in front of the I building. Refer to the flyer for details. 4) 第五届美国青少年艺术届 is coming! Poway Performing Center, May 5, 6:30 pm. Please refer to the attachment. 5 VIP tickets are available for sale. d) Enrichment class enrollment begins in August, as we are still working on next year's program. 6) Need a tutor to prepare for your finals on math, chemistry, biology subjects? We have a great volunteer, a Ph.D student who also went through Chinese school and fully understand the needs of our student. Contact us for details. 7) Performance at Graduation/Promotion Ceremony ! 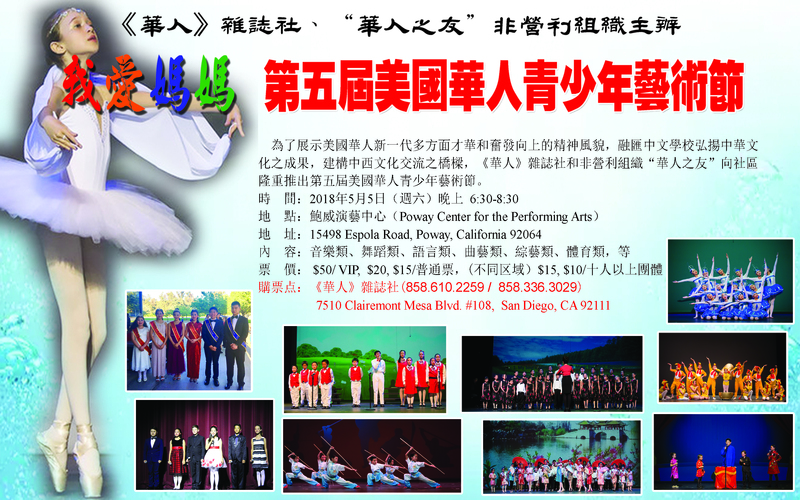 Please send Performance Registration to Zhong Laoshi at kzhong@sdhxcs.org . 8) Graduation/Promotion Ceremony will be held on Saturday, May 26. Mark your calendar! 8) Teachers' Appreciation Dinner will be held after the Graduation Ceremony on Saturday, May 26.